Very simple passive subscreen. It's a test, I might revision this later. 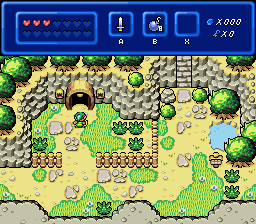 I don't know if this was your intent, but on those overworld screens, your subscreen almost looks like a blue sky above that bright outdoor scenery. That's... actually a cool idea! Kind of like Animal Crossing: New Leaf where the world bends at the horizon allowing you to see the sky. You could have a different sky backdrop for each DMap passive subscreen (day, night, evening, stormclouds... along with mountain peaks, treetops, towers, etc.). Edited by Cukeman, 03 August 2017 - 06:33 AM. No posts here in forever! Thoughts? The only thing I'm not sold on is the key icon. It obviously looks good, but part of me is unsure about it. Any comments or suggestions? 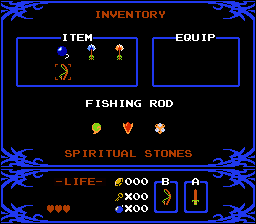 By the way, the rupee and key fit into an 8x10 pixel box. Edited by Jared, 13 May 2018 - 11:46 AM.